marys bites: Love my tomatoes! Here it is Monday again. Tomatoes are waiting to be canned and I will postpone until tomorrow. I have decided that I need more tomatoes before I start my process. Who wants to do it twice? 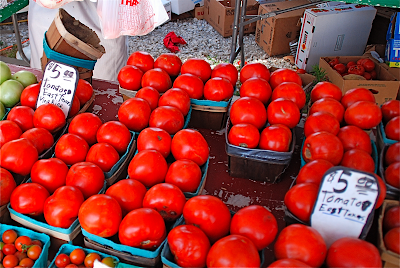 I will go back to the farmers market in the morning to retrieve the rest of the tomatoes. It's been a busy day from paying bills (not fun) to finding an airline ticket for Ashley to come home for Thanksgiving. It will be here before we know it. Thanksgiving, yum, can you tell I am hungry. Just picture all that lovely food!